The La Cornue Experience, Part 1: Discover the CornuFé Series – Design Your Lifestyle. 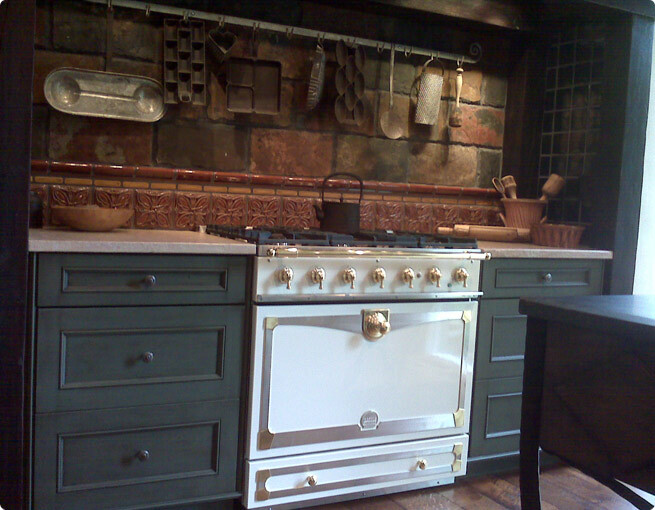 November 2013 November 2013 Peter Salerno, Inc.
One of the perks of being an award-winning kitchen design firm is the ability to work with world-renowned vendors, artisans and kitchen craftsmen. 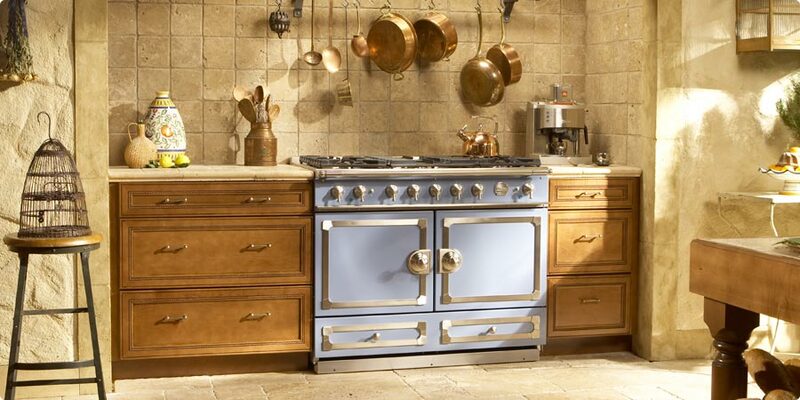 At Peter Salerno Inc., we take pride in our partnership with one of the foremost custom cooking range, oven and rotisserie companies in the world, La Cornue. Welcome to the luxurious world of La Cornue. Today, we feature the CornuFé range. (Credit: La Cornue, 2013. All rights reserved.) CLICK ALL PHOTOS TO ENLARGE. Last week, Craig Kmiecik gave us a guided tour of the four world-class La Cornue pieces (3 cooking ranges and a rotisserie) on display in the Peter Salerno Inc. showroom, analyzing the core benefits of each model and what each can bring to a discerning homeowner’s kitchen. It was a master class in culinary luxury and history, and we’re grateful to Craig for his time, effort and expertise. Given that Craig’s knowledge base (and the La Cornue product line as a whole) is so broad, we are breaking down each of La Cornue’s 3 major product lines into a separate piece. Read all three, and decide which industry-leading, master-crafted La Cornue cooking appliance is right for your home. We start our journey through the La Cornue product line with the CornuFé Series, the most streamlined and space-efficient line of La Cornue cooking ranges. Although your CornuFé range may be smaller than the CornuFé 1908 or Château range, it certainly does not lack in diversity, power, or beauty. A stunning ivory white CornuFé range with single convection oven. (Credit: La Cornue, 2013. All rights reserved.) CLICK ALL PHOTOS TO ENLARGE. Each CornuFé range boasts a choice of either one or two electric convection ovens, which provide seven distinct cooking modes. This allows the CornuFé the versatility needed to fulfill any recipe or culinary creation imaginable. The French enamel side-swing doors allow tremendous ease of entry and motion, and each CornuFé range comes with four interior oven racks – two flat and two dropped. In addition, the CornuFé includes two enamel baking trays and a trivet. Each of the seven distinct cooking modes in CornuFé range ovens – thaw & serve, convection oven, convection broiling, convection assisted, conventional oven, browning and warming – covers its own array of recipes, foods and preparations. From the even-heat baking of the convection oven mode, to door-closed broiling for meat and fish, to simple crisping of quiches and pizza using the warming feature, the CornuFé range is versatile enough to handle the needs of any chef, home or professional. 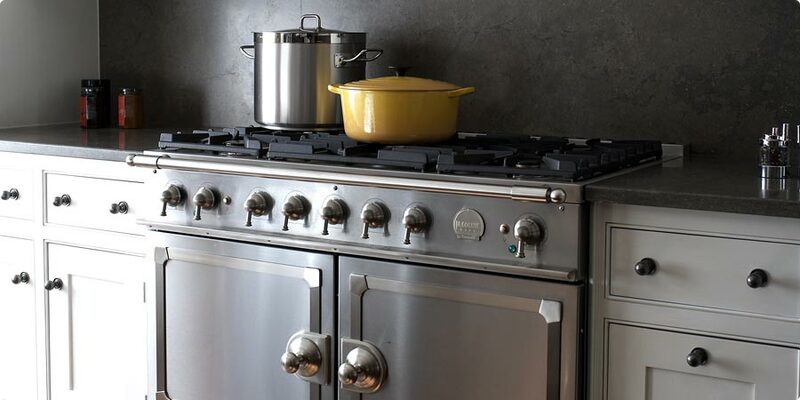 The CornuFé 110, with its powerful five-burner cooktop, in stainless steel. (Credit: La Cornue, 2013, all rights reserved.) CLICK ALL PHOTOS TO ENLARGE. The CornuFé range also has a French-inspired five burner cooktop that combines ample cooking space with unmatched power. The cooktop boasts a central, 17,500 BTU burner, three 12,000 BYU burners, and one 6,000 BTU simmer burner. As an optional extra feature, your CornuFé range can also handle a griddle on the cooktop. Beyond the sheer power, versatility and cooking options the CornuFé range provides, the line is available in eight beautiful colors and three trim accents, which can be combined to match the taste of the owner. CornuFé ranges are available in Gloss Black, Matte Black, Pure White, Ivory White, Provence Blue, Royal Blue (the newest color option), Dark Navy Blue or Stainless Steel, and accented with Satin Chrome, Satin Chrome and Polished Copper, or Satin Chrome and Polished Brass trim. The CornuFé series is available in two sizes: the CornuFé 90 (90 cm width, or 35.4 inches) and the CornuFé 110 (110 cm width, or 43 inches). Keep up to date with our blog at Peter Salerno Inc. – in our next La Cornue Experience feature (Part 2), we will explore the newest hybrid in the La Cornue cooking range family: the CornuFé 1908, which combines the vaulted oven design that made Albert Dupuy and La Cornue famous with the versatile five-burner cooktop of the CornuFé series. Thanks for sharing this post.it such a nice convection oven product and fully Automated to give efficient output .i am happy to buy this. Pingback: The La Cornue Experience, Part 2: The CornuFé 1908 | Peter Salerno Inc.
Pingback: The La Cornue Experience With Master Chef Michael Latour [VIDEO] | Peter Salerno Inc.
Pingback: Elliot the Elf Visits Peter Salerno Inc.’s Showroom [PHOTOS] | Peter Salerno Inc.
Pingback: Peter Salerno Client Interview: Julie Connors and Her National Award-Winning Kitchen! | Peter Salerno Inc.
Pingback: Earth Day 2015: Peter Salerno Inc. Offers Green, Sustainable Design | Peter Salerno Inc.
Pingback: Experience the New Peter Salerno Inc. Website Design! | Peter Salerno Inc.
Pingback: Summer 2016 Kitchen Design: La Cornue Blends Color And Sophistication – Design Your Lifestyle. Pingback: Why We Trust, Support and Work With La Cornue – Design Your Lifestyle.